I sing on the worship team at our church. I don’t sing every week, but when I do, it means that I get there an hour before the first service. Paul gets the boys out of bed, feeds them breakfast, dresses them, and gets them out the door. He has varying degrees of success showing up on time for the service, depending on tantrums, strategically timed poopy diapers, and general cussedness. Often, he’ll text me when he leaves the house or arrives at church, just so I know what’s up. And occasionally to complain a little. Those darling boys can be a full-tilt pain in the neck when they decide to turn it up. Yesterday, I was singing, so I sailed off unencumbered into the dawn, with, “NO! Do not hit your brother with that!” ringing in my ears and – full disclosure – just a touch of schadenfreude in my heart. Cut me some slack. He gets to go off by himself almost every day. I drove to church, ran through the worship set with the band, and then settled down in the music office to wait for the service to start. I got a text in remarkably good time that said the brood was leaving the house. I figured he might actually be in his seat before the first song started. He didn’t get there for the first song. He didn’t get there for the second song. He didn’t get there for the third song, and I started to steam. I walked around the hallway in the back, and slipped through the door during the communion prayer. And there he was, sitting all calm in the bench, like he hadn’t been 25 minutes late. The bench we typically sit in, since I haven’t told you, is riiiiight up front. So he walks all the way up the side past everybody, no matter what time he gets there. Oh. Maggie just started coming to our church. She doesn’t have access to a car. This isn’t the first time Paul has seen her walking and given her a ride. So, yeah. I’m a jerk. But I did think about why I was all worked up about Paul being late(r) that morning. It wasn’t because I thought he really, really needed to hear the music that morning to complete his spiritual experience. It wasn’t because I wanted him to hear me sing. It was because I was worried about what people would think. Would they think I was a bad mother and/or wife because I left him on his own some Sunday mornings? Would they think he was lazy and apathetic? Would they think we just didn’t care? I was upset because it looked bad. I’d like to think that if I’d been in the car with them, I wouldn’t have hesitated to stop, just as Paul didn’t hesitate. I’d like to think that I’d have climbed happily into the backseat between the carseats to make room in the front, and not worried about whether it was taking extra time and making us late. But I know what I’m like. I think Paul would have stopped, and I would have gone along, but I wouldn’t have been happy about it. I’m afraid that I’d have been less worried about helping someone and easing their burden a little, and more worried about what it would look like when we slunk into the service late. Again. And that, my friends, is a flaw that runs deeper than dawdling. I’ll be working on that. If you have any suggestions, feel free to leave them in the comments. 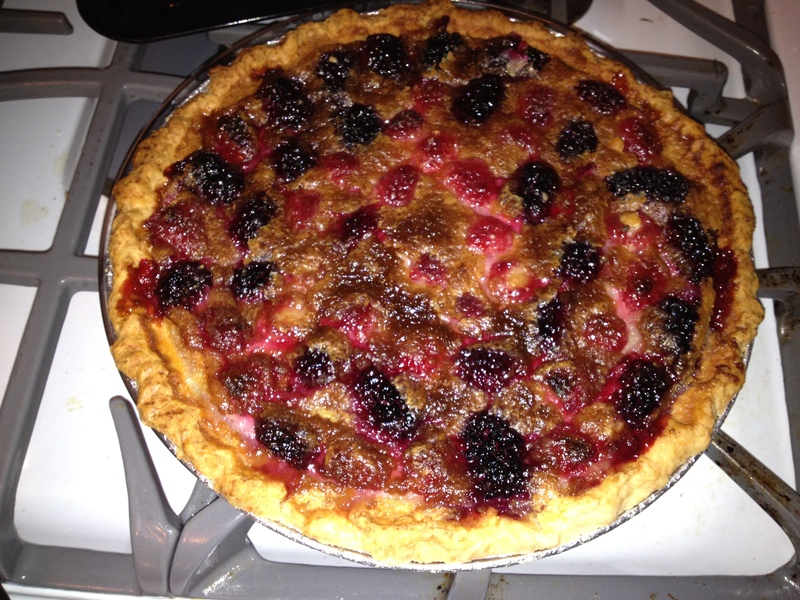 Berry custard pie I’m pretty good at. Humble pie, not so much. *Not her real name, because she didn’t sign up to be in a blog. Next Post I have to say that out loud? Ah…sounds so familiar. I, too, worry too much about ‘what others will think’ and often hurt my kiddos’ feelings in the process. Shame!on!me!!! I find that the hardest part is admitting our faults…and once we can eat our humble pie and admit our faults, we grow from it and the issue fades away. Recently I attended a conference for adoptive mamas and one of the speakers made the statement, “The thought of being embarrassed drives so much of the way I parent.” Ummmmm…..big ‘old “Amen!” from this corner, I’m afraid. WHY are we women so prone to focusing on what we think others are thinking about us, and WHY do we let it affect our relationships so much? I don’t have answers for you, because I’m squarely with you on this one. It’s definitely something that I need to work on.